When you're starting a new flower garden, one decision you'll have to make is whether you want to grow annual plants or perennial plants, or a combination. Both types of plants have their advantages and disadvantages. The climate and your personal gardening style will also be factors in deciding what type of plants you can grow. Annuals are plants that only live for one year. An annual plant will germinate in the spring, produce flowers and seeds in the summer or fall and then die at or before the frost. Some annuals are self-sowing, which means their seeds will stay active in the soil over the winter and will sprout the next spring. 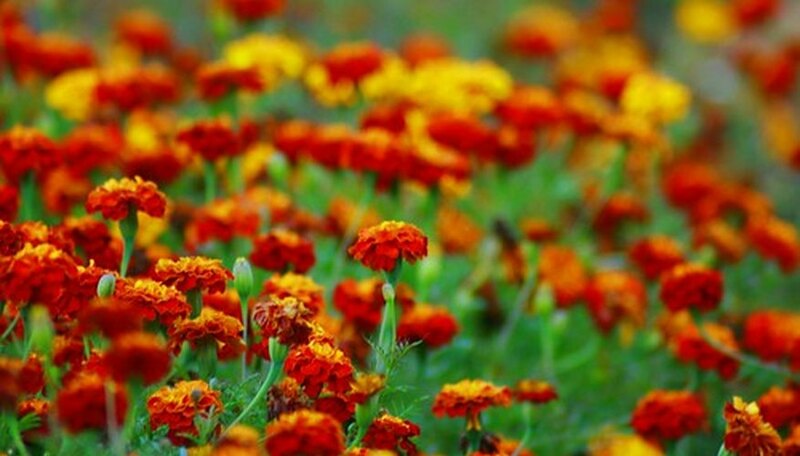 Popular annual plants include marigolds, petunias and zinnias, as well as most garden vegetables like tomatoes, beans or pumpkins. Some herbs, like basil or dill, are annuals. The life cycle of a perennial plant lasts for many years. Many perennials only put out leaves and roots for the first year or two or more, and it is only once the plant is established and mature that it will flower. Other perennials will flower their first year. Tulips, daylilies and peonies are examples of perennial garden flowers, and many wildflowers such as trillium, cardinal flower or butterfly weed are also perennials. Asparagus, rhubarb, chives and mint are perennials that can be found in vegetable or herb gardens. Some plants are biennials, which means that their life cycle lasts for two years. Often they will produce a rosette of leaves the first year, and will then flowers and seeds the next year. Many biennials are self-sowing. Mullein, hollyhocks and foxglove are biennial flowers, and burdock and parsley are edible biennials. Most annual flowers and plants can be grown in any climate, although plants with a longer growing season, like watermelons, may have to be started indoors in the winter in cooler places. Since perennials need to be able to survive year after year, regions with colder winters will have fewer options for perennials. Some plants, like geraniums, are grown as perennials in warmer climates, but as annuals in colder areas. Gardeners in regions with harsh winters may have to dig up certain tender perennials, like calla lilies or gladiolus, in the fall and replant them again in the spring. Once established, perennials often require little care beyond weeding, although they may need to be lifted and divided or replaced with newer plants every few years. Self-sowing annuals and biennials can be treated as perennials. Perennials are a good choice for permanent gardens or for naturalizing. Growing annuals gives you the option of redesigning your garden every year and trying out new plants or new combinations of colors. Annuals are usually cheap and fast growing, so it is easier to pull and replace damaged or sick plants. WHAT IS AN ANNUAL, PERENNIAL, BIENNIAL?